Image from Chemi Lhamo Instagram via The Stand News. This article was originally written by Leung Hoi Ching and published in Chinese on Hong Kong based citizen media, the Stand News on February 15, 2018. The following trimmed English version is translated by Zhao Yunlin. On February 9, students at the University of Toronto’s Scarborough Campus elected Chemi Lhamo, a 22-year-old student of Tibetan origin, as their student council president. Just days after the election results were announced, thousands of mainland Chinese overseas students signed an online petition of protest, accusing Lhamo of having close associations with pro-Tibet independence organizations. They demanded the school disqualify her from the elected position. Lhamo’s personal social account was flooded with demeaning comments and veiled threats of violence from overseas students who appeared to be from mainland China. 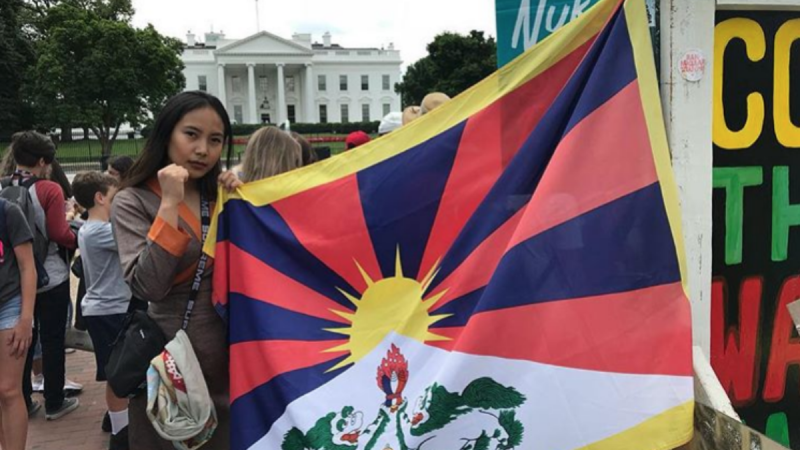 As her story began to make headlines in international media outlets, students from Hong Kong and Taiwan fired back in defense Lhamo’s defense. In a phone interview with Stand News, Chemi Lhamo said she believed that the incident was mobilized by organizations associated with Chinese government, an accusation that Chinese officials have denied. She also said that her fellow students from mainland China began to behave strangely. One of Lhamo’s classmates from mainland China spontaneously asked her, via mobile message, to draft a statement regarding Tibetan independence. She also received phone calls playing “red songs” (propaganda songs praising the Chinese Communist Party). Lhamo could not understand these songs, as she does not speak Mandarin Chinese. Alongside the joint attacks and the comments on the internet, a group of students went to the student council office to demand that the election results be reconsidered. The campus student council has now temporarily closed its conference room, for safety reasons. Chemi Lhamo has been a student activist for some years. She is an active member of the Tibetan community in Toronto and once joined a protest outside the university’s Confucius Institute, the local branch of a global network of Chinese cultural institutions that are sponsored by the Chinese government and intended to promote China’s soft power overseas. In recent years, she has also exchanged views with social activists from Hong Kong and Taiwan on topics related to freedom of speech, self-determination, democracy and related topics at public events. Lhamo has never been afraid to speak up or show her Tibetan identity – she wears a Chuba, the traditional Tibetan dress, every Wednesday. Until the election, she had never perceived any animosity from her Chinese classmates. This is what led her to worry that this barrage of harassment was instigated by Chinese authorities. Before immigrating to Canada at 11 years of age, Chemi Lhamo was a stateless refugee residing in India. Her grandparents were forced into exile along with the Dalai Lama in 1959. Within these rigid borders, no matter where she and her family went, they were looked down upon. At the time, Lhamo was only 12 years old. Feeling insecure about her identity, she convinced her parents to move back to a neighborhood with a Tibetan community. From then on, she learned more about Tibetan language, culture and Buddhism and became an activist. For Lhamo, the ideal world is one without borders or boundaries — Tibetan independence and autonomy is not the real issue at stake. Many people in Hong Kong believe that China has become more authoritarian in recent years, adopting a more heavy-handed policy towards political dissidents and ethnic minorities. Even in Hong Kong, the space for freedom of speech and association has diminished.